Care for Your Health is a Maryland-based 501(c)3 nonprofit that creates neighborhood micropractices where medically underserved patients receive high-quality care. A micropractice is a high-tech medical practice where doctors typically work alone with reduced overhead costs and little to no staff, allowing them the opportunity to see fewer patients and to spend more time with their patients. According to the Maryland Department of Health and Mental Hygiene Maryland Plan to Eliminate Minority Health Disparities: A Healthier Future for All Marylanders (2006–2010), diabetic end-stage renal disease among Latinos is 10% to 20% higher than for non-Latino Caucasians ages 55 and older, and hypertensive end-stage renal disease rates are 1.5 to 5 times higher than for Caucasians. The rates of obesity and overweight among Latinos have increased sharply over the last 3 decades. The plan by the Maryland Department of Health and Mental Hygiene also determined that because of a lack of health insurance and the high cost of health care, Latino people, in particular, tend to seek care when the severity and stages of their diseases are more advanced, and subsequently, they suffer poorer medical outcomes. Because of these factors, Care for Your Health decided to offer a home cardiovascular screening as part of the Door-to-Door program. With funding from the Office of Disease Prevention and Health Promotion (ODPHP) through the Healthy People 2020 Community Innovations Project, the program hired a Latino member of the community to canvass the neighborhood to provide home-based cardiovascular health screenings and to educate them on how to access the health care system in their community. According to research conducted by the Latino Health Initiative, traditional outreach activities and marketing of health care services were not effectively reaching all segments of the Latino community. Dr. Anna Maria Izquierdo-Porrera expressed that some Latinos in the community are socially isolated. Typically, immigrants come into the health care network by word-of-mouth, through friends and relatives, yet many new immigrants do not have these connections. In addition, many individuals work two to three jobs and don't have the time to figure out how to access the health care system. At first, the program faced challenges since the community was not familiar with the project; thus, the number of home screenings was low. Care for Your Health decided to add weekend and evening screenings and also gave people the opportunity to schedule a screening as opposed to being screened on the spot. The health screener left doorknob hangers behind to inform potential participants that the screening program was available to them and how to get in contact with the program. 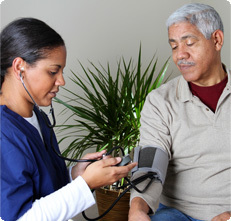 Care for Your Health believes that because of theses changes, the number of people who chose to do a home cardiovascular screening increased. Prior to participating in the program, only 24 (19%) of 128 participants reported having their cholesterol checked in the previous 2 years. After participating in this project, all participants had their cholesterol checked, and nearly a third learned that they had elevated low-density lipoprotein (LDL). The health screener gave all participants their results, color-coded for the benefit of low-literacy participants, and educated all participants on exercise and healthy eating. Also, prior to the program, the majority of participants (88 of 128/69%) did not have a primary care provider. This was reduced to 55% based on individuals scheduling appointments with Care for Your Health after the screening. Participants also had their blood pressure checked and received education on how to maintain normal levels. Dr. Izquierdo-Porrera is excited about the success of the Door-to-Door program, an outreach strategy to provide health care access to low-income, socially isolated people from diverse ethnic backgrounds. To provide high-quality, patient-centered, primary healthcare for the underserved through a low-overhead, high-efficiency, economically sustainable Micropractice model that is centered around patient experience.